Listaverkin í safninu koma úr ýmsum áttum. Sum koma frá Landsbókasafni Íslands eða Háskólabókasafni frá fyrri tíð þessara safna en önnur eru nýrri viðbætur. Margar gjafir bárust í tilefni af stofnun nýs safns, Landsbókasafns Íslands - Háskólabókasafns, við sameiningu eldri safnanna tveggja árið 1994. 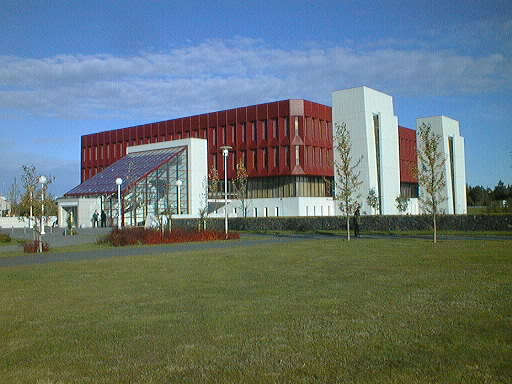 Some of the works presented in this guide were owned by The National Library of Iceland, and others by the The University Library, from before the two libraries were amalgamated. Many works were given to the new library at the celebration of the opening in the new building on December 1st 1994. Tilgangur þessa vefs er að gera gestum fjær og nær, svo og starfsmönnum Landsbókasafns Íslands - Háskólabókasafns, kleift að kynna sér listaverk í eigu safnsins. Á fyrri hluta vefsins eru verk sem eru í almennu rými, þ.e. því sem gestir hafa eða geta fengið aðgang að. Önnur listaverk í eigu safnins eða Háskóla Íslands í skrifstofum og vinnusvæðum starfsmanna, göngum og fleiri stöðum eru undir flipanum Ýmis verk. The purpose of this guide is to give guests near and far an opportunity to view some of the art objects owned or kept in the National and University Library of Iceland. Only works in public areas are included in the first part of the guide but other works in staff offices and other areas can be viewed under Other works.